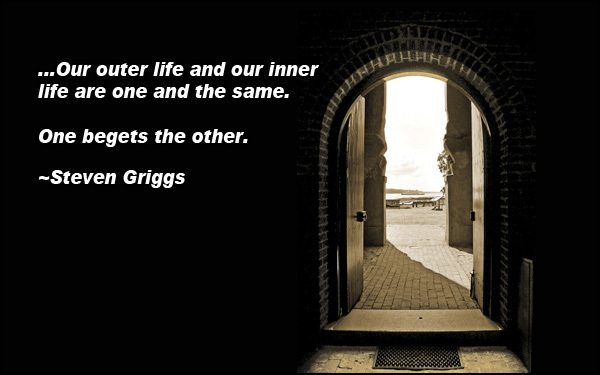 When talking about our exterior life vs our interior life there really isn't any versus, because our outer life and our inner life are one and the same. One begets the other. They may seem separate but they are not. We create our exterior life by what we believe and visualize in our interior life. The only difference is that sometimes there is a delay from when we begin imagining our desired life to when it actually starts showing up. But I am talking about the basic circumstances of our life. How and where we find ourselves. The issue we face is that sometimes we get it turned around and think our outer world, our exterior, is the real world and our interior world is just a world of daydreams and wishes. Another problem for a lot of us is that we become sidetracked and blocked by the obstacles, the problems that crop up. We begin to wonder: “Why is it so hard, why is this happening?” “I didn't want this, this isn't what I was moving towards”. We see these as negative because they contradict what we say we “want”. The truth is that this is happening because our interior dialogue is not totally clear and in alignment. Somewhere in our interior world we are getting blocked because we aren't really clear about our intentions. A limiting belief is clogging up the machinery. We are getting what we say we don't want because we aren't totally clear on what we do want. But when negative things are happening it gives us the opportunity to look into our self and seek out the source of this seeming contradiction. To take an interior inventory and find out where those beliefs are coming from. What am I really believing? We may see situations as “bad” or “negative” because they may be difficult or painful to move through. But the truth may be that this is part of the process, a step that is required for us to move forward, towards our new paradigm. In other words the path we take isn't always in a straight line, in fact it probably never is but we keep moving forward. When we come to a crossroads, we turn left or we turn right but there is no wrong turn. Each step of the way gets us a little clearer, a little better at seeing the truth, and a little further along on our journey. I personally don’t believe our interior and exterior worlds will ever be in complete alignment because as we grow our needs change and our exterior will need to be adjusted to reflect the new vision from the interior.